Our Traditional Guards or Contemporary Fireguards offer the perfect stylish solution to your woodburning stove problem – keeping Fido and children safe from fire. 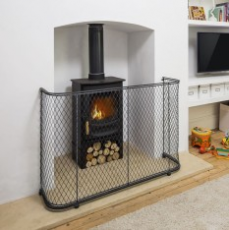 Of course, it may be that you need to keep Tiddles and the grandchildren safe, either way, our Traditional or Contemporary fireguards will ensure that there’s a design and finish to suit any interior and that everyone is kept at a safe distance from the heat source, be it stove or open fire. For added security and peace of mind, always fix the fireguard to the fireplace or wall with our optional side fixings. For more information or for a made to measure fireguard, please call us or email us on 01225 851577 info@garden-requisites.co.uk.